Charter captains on the Great Lakes don’t waste much time testing every new lure that hits the market. They know the two or three best baits for trolling for walleyes and that’s that. Don’t even bring a new lure to the party. It happened last fall in the Central Basin. The Smithwick Perfect 10 Rogue counted coup on walleye and topped the performance of every hardbait competitor, old and new. “By season’s end a lot of captains had all but abandoned the traditional trolling lures they’ve used for years,” says angler Matt Hougan. If Hougan gets exuberant over the success of the Perfect 10, he has good reason. 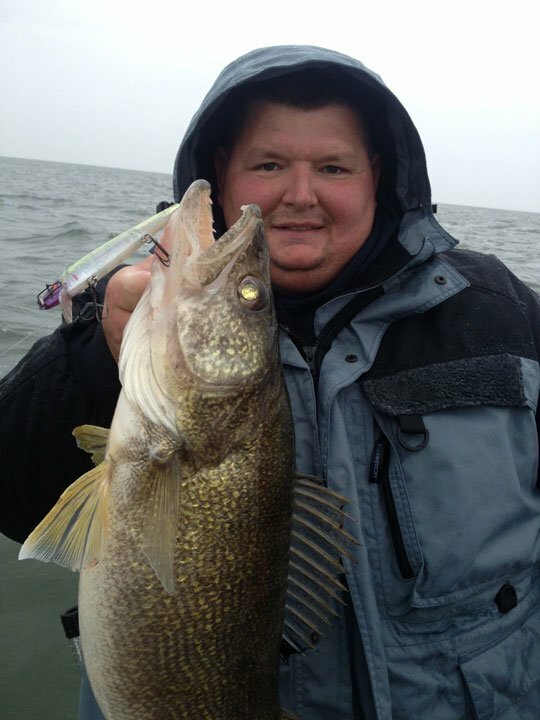 As a salesman for Smithwick, Cotton Cordell, Bomber and other fishing companies, he represented the companies as first-time sponsor for the Fall Brawl, a popular month-long walleye event in Erie’s Central Basin, which stretches roughly from Huron to Cleveland. Hougan fished the first evening of the 2013 Fall Brawl, and his boat captain rigged up with traditional Erie trolling lures. 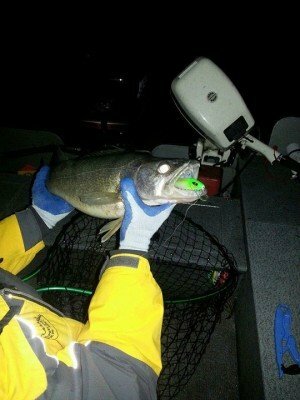 Hougan always finds this situation a little awkward, but captains use what has worked in the past and what they feel gives their anglers the best shot at catching big walleyes. After fishing for nearly an hour without a strike, however, he asked the captain if they could give “one of my baits” a chance. No doubt the crew expected Hougan to pull a Cordell Wally Diver or a bait from the Bomber Long A series from his bag. But the sight of several Smithwick Perfect 10 Rogues sparked another thought. Prior night patterns had found fish feeding in the upper third of the 30- to 38-foot water column. The captain set the bait exactly as he had the others, 10 to 15 feet behind a side-planer board. He had barely set the rod in the holder when it buckled. Minutes later, a walleye weighing nearly seven pounds came over the gunwale. The first fish proved to be no accident when they went to reset the line. He had a few customer samples, and each saw serious use that evening. Word spread through the tournament ranks that night, and it continued to spread. Within a couple of weeks, almost everyone Hougan talked to was pulling the new jerkbait. So you don’t think this is just a salesman’s story created to add money to his bottom line instead of adding fish to yours, outdoor writer and tackle shop owner Craig Lewis lends credibility to Hougan’s account. Lewis owns Erie Outfitters tackle shop and Internet sales operation in the Ohio community of Sheffield Lake. Lake Erie walleye hunters form a large part of his customer base. And, with some veteran Erie trollers claiming the Perfect 10 outfished other baits by margins of five- and six-to-one, the word is getting out. 1) Speed control — It has a wider wobbling action than some of the tight-wiggle mainstays, and can maintain its action at very slow trolling speeds. 2) A wiggle with your roll — Its “Rogue” action adds a side-to-side roll to its wobble, which produces more baitfish flash. 3) It thumps – A big single tungsten rattle generates a “thump” and vibration that is distinctive from the ticking sounds of baits with more conventional, multiple rattles. Veteran Erie anglers know that walleye color preferences do not always align with the forage base. About half the colors of the Perfect 10 Rogue line-up are subtle, transparent baitfish generalizations. The rest feature reflective sides that produce bright baitfish flashes when in motion. Other colors with a reported following are Table Rock Gold, Juice and Ayu. Reports are that the most productive color patterns for daytime trolling are just as effective at night. At night, walleye tend to suspend higher in the water column, and a standard side-planer set-up with the bait running 10 to 15 feet behind the board seems to keep the Perfect 10 right where they want it. When sunlight drives fish deeper, however, trollers add 1 1/2-ounce in-line weights about 6 feet in front of the bait and extend the line between board and bait 35 to 55 feet. Many of Erie’s walleye watchers regard last fall’s performance by the Perfect 10 as a mere dress rehearsal for the big show that lies ahead. Historically, early spring walleye patterns pick up where they left off at early ice. That bodes well for the Perfect 10’s spring debut in the “West” come March and April. Bigger yet could be the bait’s prospects this summer after precision-minded trollers have calculated the Perfect 10 Rogue’s depth dynamics.